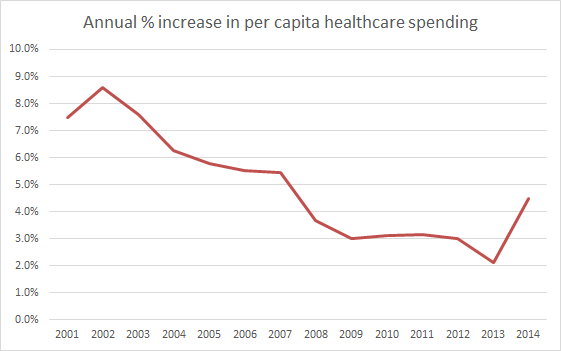 Not too long ago healthcare spending was going up around 8% a year. That has slowed down recently. 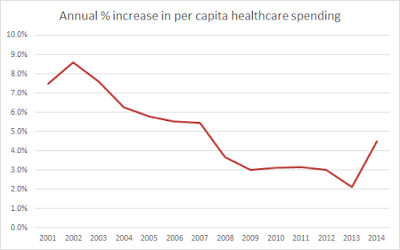 I thought it would be interesting to see the rate of change in per capita spending recently. I got the data on the CMS site where it says that "The National Health Expenditure Accounts (NHEA) are the official estimates of total health care spending in the United States." They only have data up to 2014 so far. The most recent 5 years have been going up ~3% a year. However during those years inflation in general was only averaging about half of that in the 1-2% range.